Crosses of Naval Merit (Spanish: Cruces del Mérito Naval) are a Spanish military award for gallantry or merit in war or peace. 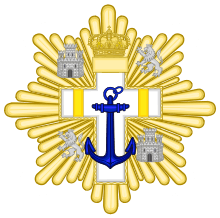 Awarded to members of the Spanish Naval Forces, Guardia Civil or civilians. 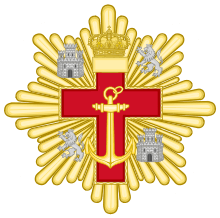 Established on 3 August 1864 by Queen Isabella IIas the Order of Naval Merit (Spanish: Orden del Mérito Naval) and amended many times (in 1918, 1926, 1931, 1938, 1942, 1976, 1995, 2003 and 2007). During the Spanish Civil War it was recognized by both sides of the conflict. Awarded originally in four classes, nowadays it lost the rank of an order of merit and the classes were reduced to two and the number of categories extended to four.